In good working condition. Has a few light scratches on the front. An extremely well designed amplifier by Nelson Pass while at Threshold using the proprietary STASIS technology. Operates initially in a more linear Class A mode, then switches into Class AB mode when more power is needed. This particular amp is exceptionally liquid sounding, very smooth, very articulate and detailed as Threshold amps are known for. It has plenty of power for it's relatively compact size. Conservatively rated at 100 watts per channel, there's enough headroom to handle the most demanding music passages. Factory Serviced by Krell within past 10 years. Very lightly used. Original Krell box, power cord and manual included. This is your opportunity to own one of the sweetest sounding amplifiers ever built at a fraction of the cost when new. To John, this was nothing more than elitist mysticism. Then, he just built a transistor circuit that emulated those waveforms. Includes tubes and power cable. unused in the open box. Excellent condition with no defects or flaws. Made in California in the late 80's. Great sound quality. Up for sale is a powerful and sweet sounding Hitachi HMA-8300 power amp in great condition. - Power output: 200 watts per channel into 8Ω (stereo). - Semiconductors: 1 x IC, 40 x transistors, 51 x diodes. It is in excellent, like-new condition. If you know Audio then this product really needs no explanation of how great it is. SG-350S 2A3B Hi-End Class A Tube Integrated Amplifier. Output Tube: 2A3B x2. 115V U.S VERSION. Input/Driver tube: 6N8Px2. Rectifier Tube: 5Z3P x1. OPENED BOXES FOR TEST AND WORKING GREAT. Hi END Outstanding Signal/Noise Ratio:90dB. 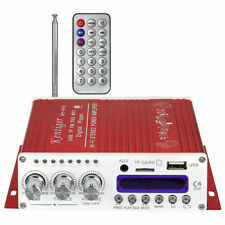 5.1ch class T digital amplifier . Shipped with USPS Priority Mail. With the classic tubes matching:6N9P EL34B, GemTune GS-01 Tube Amplifier brings you firm and full mids, smooth highs and also deep lows. It is perfect for vocals (natural and sweet), strings, pipes, and jazz. Recently refurbished by Audio Gear in Burbank, CA, the Avalon manufacturer service center Avalon VT-737 SP Class A Vacuum Tube Microphone Preamp. Condition is Manufacturer refurbished. Shipped with USPS Parcel Select Ground. Unlike the A30 and A32 series, this is the 1st amplifier to use Primare's new UFPD class D technology. Input sensitivity: 1.6V. Total harmonic distortion: 0.1%. Speaker load impedance: 4Ω (minimum). Signal to noise ratio: 100dB. It's Slightly used., works great! Sold as-is. Output Power: 50W x 2 RMS. Tripath LP-2051 amplifier chip provides efficient, powerful sound, digital audio paradigm. 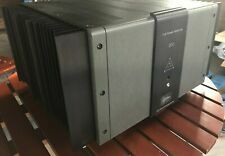 1 x Lepy LP-2051 HiFi Power Amplifier(US Plug). Two audio input ports and 3.5mm stereo input supported. Excellent amp with crystal clear sound. Cary Audio CAD-2A3 SE Mono Block Tube Amplifier 5W Class A, 7W Max Dennis Had. Condition is Used. FXAUDIO FX502SPRO TPA3250 Class D Digital Amplifier Hi-Fi Stereo Audio Power Amp. - TPA3250 Hi-Fi amplifier chip can ensure its excellent sound quality while still keep low distortion. - Amplifier sesistance: 4Ω / 6Ω / 8Ω. Luxman M-05 Amplifier. 105 watts Class A output! Original Box! Classic! Luxman M-05 Amplifier. 105 watts Class A output! Original Box! Condition is Used. This Luxman amp is a beauty! This produces over 100 watts of pure Class A power. Aside from beautiful condition the power cords and fans have been upgraded (see photos). The build quality is top notch. There was a triac that made a buzzing noise, we used to get a few in for that, that's about it. Class H amp with Vari-portional circuitry & Auto-buffer for continuous operation into 2 ohm load < of such capability, Bench Techs have said, … ".you can weld with it, ` should you drop one across its /- rail. Compact 15W RMS x 2CH Amplifier Featuring Tripath digital technology, this device provides highly efficient, high quality audio amplification. It will easily power speaker systems from desktop computer speakers to moderate size bookshelf speaker systems. Power amplifier level 6P3P standard connection, 6P3P for the entry-level products. This connection is characterized by: high amplification efficiency. To achieve the characteristics of the power amplifier tube table provided by the output power. CLASSE CAP-2100 STEREO INTEGRATED AMPLIFIER WITH REMOTE. Both channels are clean and clear with no hum, buzz, noise, or distortion. All functions, display, TFT touch screen, remote, are all working perfectly. A new class D amplifier topology provides wide dynamic range, smooth and extended frequency response and rich harmonic detail to yield stunning sonic performance. The efficiency of class D adds efficiency, low heat dissipation and relatively small size to the list of the AMP2's attributes.". Up for sale is for a Classe CA-5300 multi-channel amplifier 300W x 5. This amp has been tested and in properly working condition. All inputs and speaker outputs are checked and work fine. The switch and light on front also checked and work great. CAV-7575W SIX CHANNEL AMPLIFIER. Maximum power and Channel. Five (5) Channels. Four (4) Channels. Three (3) Channels. Input Impedance: 75 KOhm. Power consumption (idle): 75 W. Gross: 45 lb. You are looking at the Burson Audio Bang Stereo Power Amplifier. This is a fairly new product from Burson Audio. This is an audiophile Class A/B stereo amplifier that puts out 40 watts per channel. 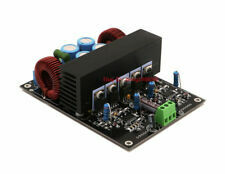 It is also the smallest Class A/B Amplifier in the world and uses their new Max Current Power Supply (MCPS). This model has the V6 Classic dual opamps which replicated a slight tube like sound signature. Brand new this amplifier sells for $599. Everything has been tested and is working perfectly. It has been meticulously taken care of. Will come with power cord and RCA cables. If you are looking for Classe music and theatre equipment, you can find a broad variety of products on eBay. Shop for a variety of equipment, such as amplifiers and preamps, for both professional and private use right here on eBay. Does Classe still make audio equipment? Earlier this year, Sound United bought the company, and now produces equipment through their company. The products continue to be manufactured for the public by the same name, but there may be some changes under the new leadership. Fans of Classe audio equipment can expect to see a revival of the brand and more products released for sale. If you are looking for Classe audio equipment, you will be able to find an excellent selection on eBay. What type of audio equipment products does Classe manufacture? Are there discontinued products from Classe on eBay? If you are looking for discontinued products, then eBay should be your destination for these items. There are plenty of Classe items listed on the website, and there may be just the item you have been searching for to fit your needs. If you dont find your item right away, keep checking back to see the consistently updated listings. Keep in mind that the availability of Classe audio equipment changes daily as items are sold and listed. Are there refurbished Classe products listed for sale on eBay? There are several listings for these refurbished Classe audio equipment on eBay. A refurbished or previously used product provides you with plenty of use time. Some of the discontinued items are listed as refurbished. If you have questions about the condition of the equipment, you should ask the seller before making a purchase on eBay. Quality can vary from seller to seller and reviewing customer feedback may be a good way to discern if the specific product is the one to meet your needs.